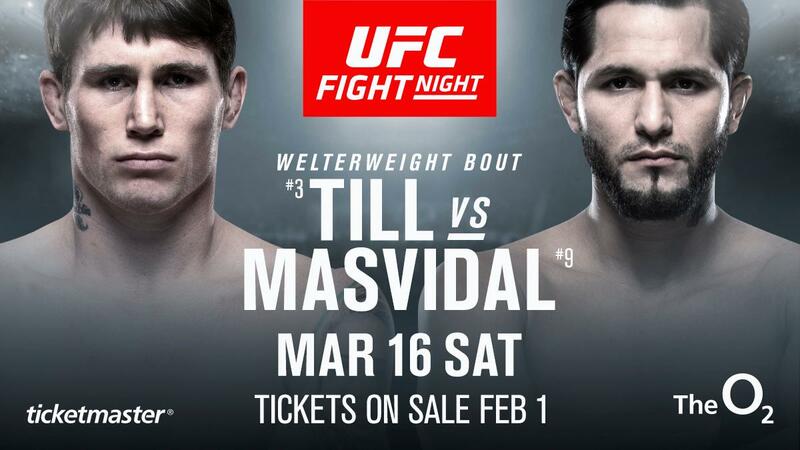 Today, UFC confirmed that welterweight and Liverpool legend Darren Till (17-1-1) will fight American Jorge Masvidal (32-13) in the main event at the highly anticipated UFC FIGHT NIGHT LONDON on Saturday, March 16, at The O2. Following a rapid rise to stardom through four straight victories over the likes of Jessin “Abacus” Ayari and Stephen “Wonderboy” Thompson, Darren “The Gorilla” Till will be looking to get back on the winning path against Jorge “Gamebred” Masvidal following his recent defeat to Tyron “The Chosen One” Woodley. Masvidal approaches the bout off the back of two losses but will be confident of staging an upset in front of the London crowd. Co-headlining the event is fellow welterweight Leon Edwards (8-2) who faces Iceland’s Gunnar Nelson (8-3). Edwards is currently on a six-fight win streak having most recently beaten Donald Cerrone by unanimous decision at UFC FIGHT NIGHT® SINGAPORE. Nelson will also be looking to build on his last victory against Alex Oliveira at UFC 231. Fans are advised to register their interest via ufc.com/London to gain early access to tickets, and to follow @WHOATV on Twitter for all the latest updates.